Marco Langbroek captured this long-exposure photo of the Air Force's X-37B space plane streaking through the sky above Leiden, the Netherlands, on Aug. 20, 2018. The U.S. Air Force's X-37B space plane may be secretive, but it's not invisible. 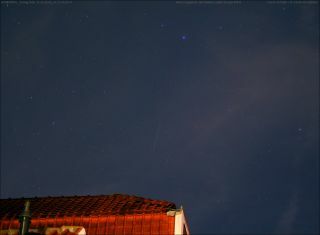 Netherlands-based satellite tracker Marco Langbroek snapped long-exposure photos of the robotic mini-shuttle zooming over the city of Leiden yesterday (Aug. 20), capturing the spacecraft's rapid trek across the night sky as a thin streak of light. Another photo by Langbroek of the X-37B's night-sky trek on Aug. 20, 2018. Also visible in this image, just below and perpendicular to the X-37B’s track, is the trail made by the French commercial imaging satellite SPOT 6. "The object in question is not in the public catalogue of satellite orbits maintained by JSpOC (the U.S. military tracking network), which shows for an object this bright that it must be a 'classified' object," Langbroek told Space.com via email. "We nevertheless know where 'classified' objects like this are, because they are routinely tracked by a small network of amateur trackers, in which I takepart." The object he photographed last night is in a very low orbit, Langbroek added: between 193 miles and 202 miles (310 to 325 kilometers). (For comparison, the International Space Station's average altitude is about 250 miles, or 400 km.) And the object actively maneuvers from time to time, so it can't be some piece of space junk about to re-enter Earth's atmosphere. In this photo, also taken by Langbroek on Aug. 20, SPOT 6’s faint track is above and to the left of the bright X-37B trail. "Basically, only one type of object fits this: X-37B," Langbroek said. "Previous X-37B missions we tracked also orbited at such very low altitudes. The object also has a similar brightness to previous OTV missions." And to really seal the deal, when you project this object's orbital plane backward in time, it passes right over Florida's Cape Canaveral Air Force Station at around 10 a.m. EDT (1400 GMT) on Sept. 7, 2017 — right when a SpaceX Falcon 9 rocket lofted the X-37B on its current mission, called OTV-5. The X-37B looks like a miniature version of NASA's now-retired space shuttle orbiter. The Air Force is known to possess two OTVs, both of which were built by Boeing. Each vehicle is 29 feet (8.8 meters) long and 9.6 feet (2.9 m) tall, with a payload bay the size of a pickup truck bed. As its name suggests, OTV-5 is the fifth X-37B mission. To date, each OTV flight has spent more time in orbit than the last. OTV-1 launched in April 2010 and spent 224 days in space; OTV-2 began in March 2011 and logged 468 days in space; OTV-3 zipped around Earth for nearly 675 days after its December 2012 liftoff, and OTV-4 launched in May 2015 and landed 718 days later, in May 2017. Air Force officials have said that the X-37B is testing reusable-spaceflight technology and gear for future spacecraft on these missions. Experts have said this explanation makes sense, dismissing claims that the OTV may be a space weapon of some sort. "During favorable passes, the spacecraft reaches magnitude +1, which is brighter than, for example, the stars of the Big Dipper and similar to the brightness of Saturn or Mars in the sky," Langbroek said. "It is easily visible to the naked eye then, even from the urban town center I observe from." The Aug. 20 photos were taken during an overhead pass during which the X-37B wasn’t all that bright. This image, taken by Langbroek on June 25, 2018, shows the space plane during a more favorable pass. Last night's pass wasn't even a particularly great one, he added. And he still used "very simple equipment: a normal DSLR (a Canon EOS 60D) with a Canon EF F2.0/35mm wide-angle lens, on a normal camera tripod. The camera was set on ISO 800, the lens wide open at F2.0, and I used an exposure time of 5 seconds."